Open Day event at the Umana Yana show cased the Centre’s work. Georgetown, Guyana. 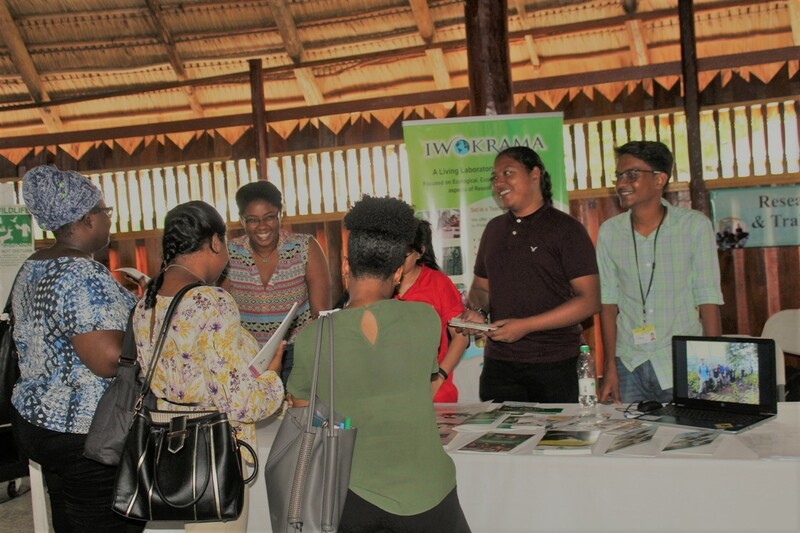 The Iwokrama International Centre on November 14, 2018 hosted an Open Day event at the Umana Yana showcasing the Centre’s work. This year marks 22 years since the passage of the Iwokrama Act which officially created the Centre. The Open Day highlighted the work and achievements over the years. The event informed and updated participants on the Centre’s work and allowed the engagement with some of the staff, including the rangers, tour guides and forest technicians based in the field. 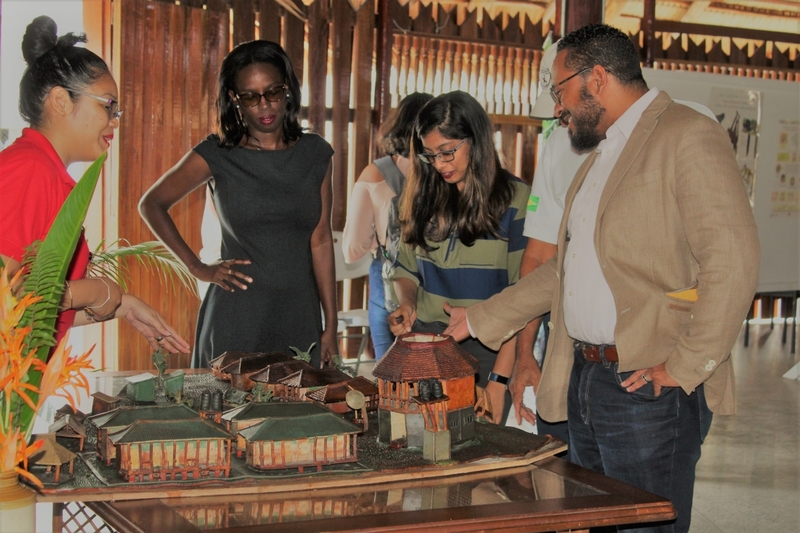 Research work, publications and videos were showcased while the tourism team shared information on the different tour packages on offer at the River Lodge. 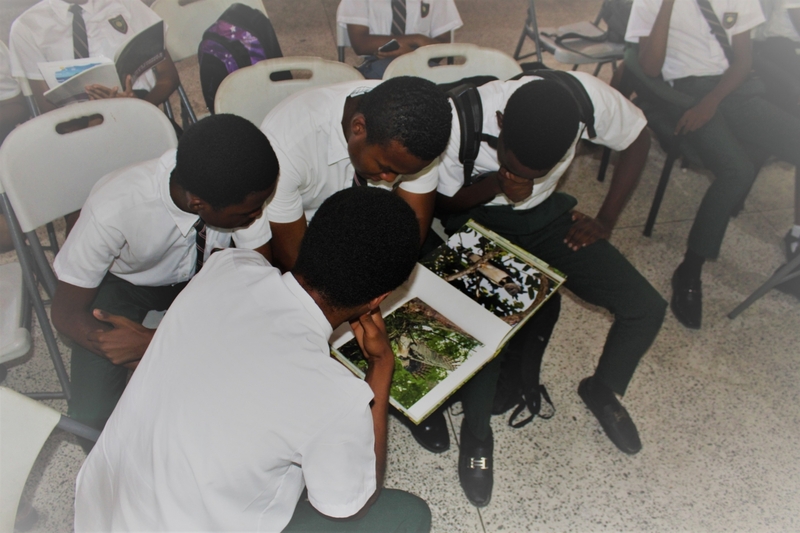 Over 250 schoolchildren and youth collected booklets and posters, and interacted with the staff on various issues related to Guyana’s flora and fauna, indigenous communities, protected areas, 3D mapping, forestry and climate change. These exchanges included impromptu quizzes for the students whose correct answers were rewarded with booklets, bookmarks and stickers produced by Iwokrama’s expert team. The information packages would assist students in answering questions in their upcoming NGSA and CXC/CAPE examinations next year. Forestry staff Nixon James demonstrating. Messers Bertie Xavier and Ivor Marslow, Vice Chairman and acting CEO respectively of the North Rupununi District Development Board (NRDDB), and Toshao Martin Carter of Fair View travelled to Georgetown to represent their communities, projects and research . The strong partnership shared between the communities and Iwokrama was very evident throughout all the displays and discussions. It demonstrated the close relationship and exemplary model for shared responsibilities and management of natural resources. 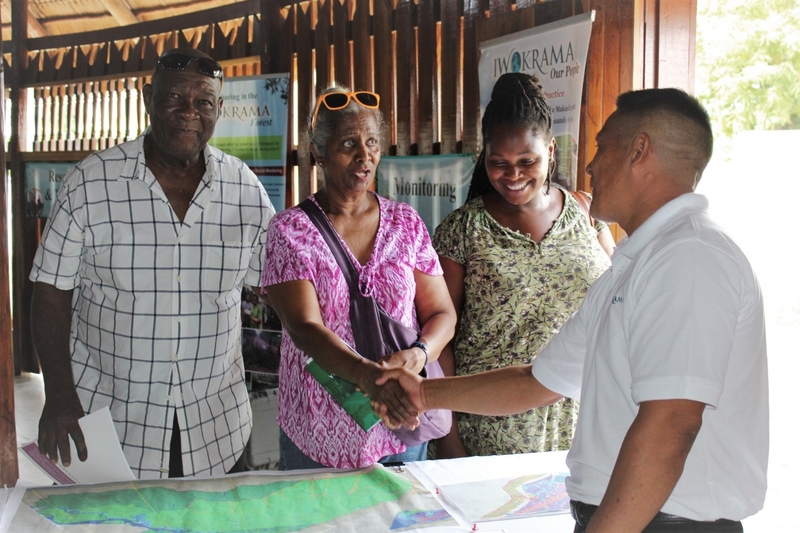 In his capacity of acting President Prime Minister Moses Nagamootoo joined other dignitaries, partners from natural resources agencies and scores of persons from the general public to learn more of Iwokrama’s work and to share in the experience. Dane Gobin, CEO of Iwokrama commented that next year, the Centre will be celebrating 30 years since then President Hoyte offered the 371,000 ha Iwokrama Forest to the international community for research at the Commonwealth Heads of Government Meeting in Kuala Lumpur, Malaysia 1989. 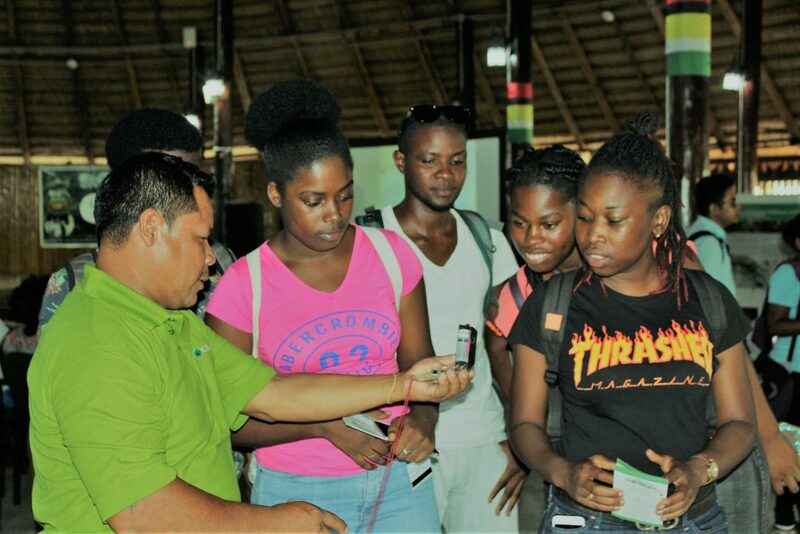 He said he was delighted at the good turnout of youth to the exhibition since these students were going to be tomorrow’s stewards of Guyana’s green economy and needed to know what an important contribution Iwokrama could make to the green economy. Iwokrama was pleased to present its Open Day as a space for discussion. The event was successful in helping the public’s awareness of the Centre and its work. The Umana Yana provided the perfect ambiance for such an engagement on this flagship project of Guyana and the Commonwealth. 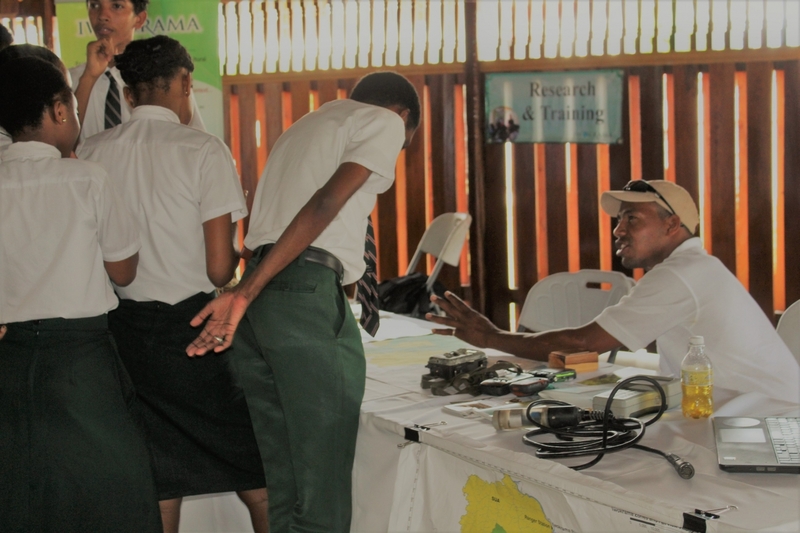 Special thanks were expressed to the University of Guyana’s Biology Club whose members, including students, helped to man Iwokrama’s Research and Training booth at the event. Some of the students have already benefited from field exposure having participated in research expeditions in the Iwokrama Forest. Iwokrama was pleased to partner with Caribbean Airlines Limited who co-sponsored the event and provided information packages for the student volunteers. Local beverage giant Banks DIH Ltd., another partner of Iwokrama, also supported the event with their products including the aptly-named Rainforest Water. The Iwokrama International Centre is also grateful to the Department of Public Information (DPI) and other media outlets for promotion and coverage of the event.